No doubt you have heard the recent buzz on ABC News about American Airlines removing a 2 year old passenger with autism and his mother from a flight. It has been well editorialized here at A Life Less Ordinary. Emily's moral of the story is basic: Do not touch another person's child without permission! I have two impressions. First, how easily it could have been avoided. Second, how easily it could have been us. Just as Kristina Chew at Autism Vox shares, I have a "trove of near-horror stories" having traveled at least once a year cross continent since our twins were 6 months old. I recall the worst incident laying over in Reno on Southwest. A seatbelt stand off between Reid and my husband (not a flight attendant) who wanted it buckled NOW. (The plane was about to land.) I think a Sprite spilled and one thing led to another...before we knew it we were watching what could only be described as a full scale anxiety attack. The only differences from the Farrell's being, we were landing not taking off and we were in a front row so we could bolt off the plane into the terminal for some relative privacy. I will never fly anywhere near Reno again! Slots being pulled everywhere in pervasive smoke, I ducked into a corridor and waited until Reid could think straight. My husband and daughter, mortified by the gawking crowd, fielded questions from ground agents and officers. In contrast, I recall being ushered by other travelers and personnel to cut to the front of the line getting through Customs in London. All could see that we needed to expedite the process or Reid was going to blow. It's not rocket science but it does take a little insight, flexibility, and humility. To the current buzz I have to add this video dramatization. It is set within a sermon by our former pastor, Neal Nybo, at Solana Beach Presbyterian Church. The entire sermon on Humility is great, but if you are short on time go to 16:15 on the counter to watch another mother with her grown daughter to see what they experience in the air. Please advance to 16:15 on the counter, to view the airline scene which is about 6 minutes long. Each of us have the choice, fellow traveler, stewardess, mother, child. Which role will you play? In his book, Christ for Real, Charles Price describes three people sitting beside one another on an airplane. One is an experienced business traveler, one a first-time flier who is pretty excited to be flying, and one a first-time flier who is motivated to get on the plane only because the plane will take her to see her grandchildren for the first time. The experienced traveler takes the journey in comfort, reading his book, napping, and casually eating the meal. He exits the plane relaxed, refreshed, and confident. He had watermelon sized faith in that plane. 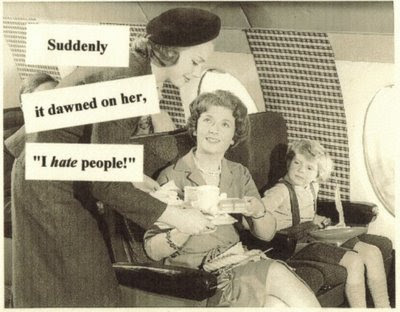 The first-time, excited flier is a bit nervous, feels every bump, is aware of every odd sound. He exits the plane a bit tired, but fine. He had peach-sized faith in that plane. The grand mum is completely uncomfortable through the entire trip, holds on to the chair’s arm rests with white knuckles, tries to eat the meal but ends up losing that. She exits the plane exhausted and worn out. She had mustard-seed-sized faith in that plane. No matter the size of their faith, they all arrived at their destination at the same time. It wasn’t that the watermelon-sized faith guy landed 2-hours ahead of the mustard-seed-sized faith lady. They only needed enough faith to get on the plane. The plane took care of the journey. God is taking care of our journey. Our level of faith in God is merely a measurement of our exhaustion level as we struggle through, or our refreshment level as we rest in Him. The comfort of the journey is up to our interpretation. It matters not the level of OUR faith; it matters in Whom we place our faith. So, are you enjoying the ride? Trusting the pilot takes a lot of pressure off. Welcome to Holland is often quoted and handed out to newly diagnosed families. It captures the emotional loss and dismay at that stage of the journey. It also stirs hopes for a new dream. Originally written by Emily Perl Kingsley about her experience with downs syndrome, it has significance to those of us experiencing other diagnoses as well. Emily Perl Kingsley is the mother of a child with down syndrome. She has done much to improve the ways in which people with disabilities are portrayed in the media. She received many Emmy Awards working as a writer for Sesame Street and integrating mentally and physically disabled children and adults into their format. Her inspirational classic has been reprinted in many languages. Dear Abby runs this piece every October to commemorate National Down Syndrome Awareness Month. When I shared it the MOPS (Mother of Preschoolers) group at our church last year I was reminded that it is even more universal than that. One of the older mentor "grandmoms" pointed out an application in her life that was not at all disability related. The fact is: managing expectations is a lifelong, human condition. Life takes many twists and turns that often diverge from what we have planned or envisioned. So, whatever your current circumstance, I hope you will pick up something new from this retelling of Welcome to Holland. You can read it below or watch this brilliant interpretive reading of it. It's like this...... When you're going to have a baby, it's like planning a fabulous vacation trip - to Italy. You buy a bunch of guide books and make your wonderful plans. The Coliseum. The Michelangelo David. The gondolas in Venice. You may learn some handy phrases in Italian. It's all very exciting. "Holland?!?" you say. "What do you mean Holland?? I signed up for Italy! I'm supposed to be in Italy. All my life I've dreamed of going to Italy." But there's been a change in the flight plan. They've landed in Holland and there you must stay. The important thing is that they haven't taken you to a horrible, disgusting, filthy place, full of pestilence, famine and disease. It's just a different place. So you must go out and buy new guide books. And you must learn a whole new language. And you will meet a whole new group of people you would never have met. And the pain of that will never, ever, ever, ever go away... because the loss of that dream is a very very significant loss. But... if you spend your life mourning the fact that you didn't get to Italy, you may never be free to enjoy the very special, the very lovely things ... about Holland. Now, for the sequel which to my knowledge was written by Lisa A. Eicholtz. It describes the relentlessly stubborn drive that we must have (or must develop) as parents of kids with autism. The conviction to never say never, always find a way, and think out-of-the-box until goals are met and skills are mastered one by one, as long as it takes. When you wake up and find yourself in Holland, you realize it is a beautiful place. But, it's not the place you want to be. 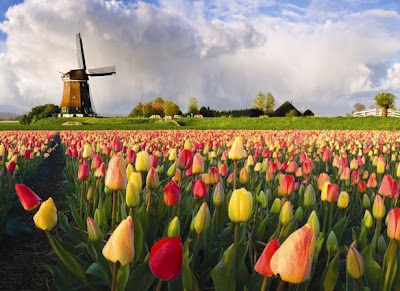 So you need to decide...do I stay here and enjoy the tulips and the farmlands? Or do I want to see the mountains and valleys and the beauty of Italy? We have decided that in spite of winding up in Holland, we really don't want to stay. No offense to Holland, but after awhile, Holland is really no substitute for Italy. So, we get out new guidebooks and we discover that sometimes, you can get from Holland to Italy. It looks like rough going and the terrain is not clear. And for some reason, there are no flights...we set off walking. We make some wrong turns and get lost--several times. But we persevere. Some day, with the right guides, and the right amount of effort, we will see Italy. Who knows this better than Jesus, our Lord and Savior, who had Eden in mind as the destination resort for all creation? When sin derailed the agenda, He stepped in Himself to walk us across borders through the "horrible, filthy place" of Earth right into Eternity--which is way more beautiful than Italy. Nerves ran high before the Kingsmen band performed at a local Borders last Tuesday. At least the parents were concerned and a bit self-conscious about letting our adolescent boys make this debut public appearance. The boys belted out "Hang on Sloopy" and the youngest member of the band (9) graced us with a heartfelt solo of Ingrid Michaelson's poignant song "The Way I Am." "Don't Worry about a Thing" chirped the Bob Marley lyrics as they called it a night. Reid said his obligatory thank you's to the cluster of teachers who came to support him, negotiated a DVD purchase with Dad and off we went to bed on a school night. All's well that ends well. Practice makes perfect. Keep up the good work. Oh ye of little faith. Music in a universal language. The show must go on. You don't mind if I write in all cliches, do you? How often have you been in a place where you could not see the future but needed to step into it anyway? The boys did this. The band leaders from The Music Therapy Center of California did it. We, moms, did it. As parents of kids with autism, we are pioneers whether we like it or not. I hadn't realized until afterwards what uncharted territory it is to have a special needs band performing in a neurotypical, public venue. It shouldn't matter and in many ways it didn't matter. At the same time, that is what made it meaningful. Perhaps the most telling commentary were from the store manager afterwards. He said the 30 minute show was better than most of the in-store events they've had. What's more...he'd love to have the Kingsmen back on a regular basis! We'll have to see about that*@!*? (His son was not in the band; I promise.) Music has a universal appeal and so does hope. Could it be that hope is what he found appealing? Hope is compelling, even marketable to him, his clientele, and to the world. My nephew has been to Berklee school of music and led bands from Boston to LA with his magnanimous personality and superior saxophone skill. He told Reid once that "Half of success is just showing up." Woody Allen thought it was 80%. True, practical, sage advice for any man. Much of what we need to know in life can be boiled down and made that simple...whether its the gospel, making a living, or pursuing a dream. Flame is a band who just showed up and now they have a custom fire painted tour bus! The group began as a recreation program at Lexington Center in New York state. They were so well received by local audiences that they've now recorded two CD's and are moving from regional to national ambitions. Check out this promo tape and you'll wonder, is it Tracy Chapman or is it Michelle King? Reading the bios of Michelle and the other band members makes that old "Up, up with people" track run through my mind! I don't do prophecy but I do enjoy forward thinking! Does anyone know of other bands like Flame and the Kingsmen? Please chime in if you do. If Genius is not Normal--What Is? What do you say when you hear someone has autism? Hard to know anymore...is it good news, bad news, or just interesting news? One of the top ten reactions I used to hear when telling others about my son is something like this, "Oh, is he really good at math? Is he one of those savants?" Well, no I don't believe he is. Reid is not savant but he is smart and skilled and capable. I am not a genius either but God thinks I am a MonaLisa! Stephen Wiltshire, featured in the video above, is an architectural artist with unbelievable talent and a mind which clearly puts him in the autistic savant category. His achievement is inspirational and unattainable to us. Like the miracles recorded in the Bible, stories of savant accomplishment strengthen our faith and hope by their superlative extreme. Seeing mountain tops can lift us up from the valley. Even if we don't climb to the top, our eyes are set higher by knowing someone else has. When Temple Grandin speaks, she often shows a slide of Albert Einstein's brain scan to illustrate that his genius was in fact, abnormality. Can you embrace what that really means? Would you rather be normal or a genius? Would you rather have a genius child or a normal child? The very questions strike are absurd? Alternatively, why don't we eliminate "normal" from our vocabulary? Who among us is normal? Who strives for it? Who is satisfied with it? Not one of us is normal in the eyes of God. Brittany Maier was born fearfully and wonderfully made in the image of God with a sizable chunk (or maybe just a sliver) of His passion for music. She was also born blind, premature, and autistic. I think it is important to view savants not as freaks of nature or purely in amazement. We need to let them inspire greatness and mutual respect in us. The Wisconsin Medical Society has an awesome site devoted to savants. 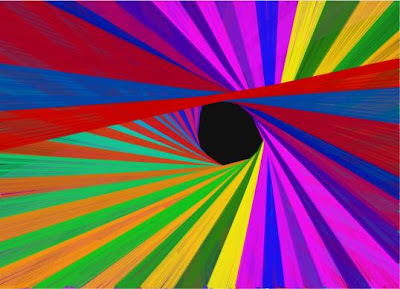 Perceiving others among us as talented changes their future, their self-perception, and our interactions. Try it! I read this post from Bev at Aspergers Square 8 about the power her father's words had over her even at age 47. Asperger's or not, we all crave words of affirmation like that from a father. Fortunately, our Father in Heaven has left us The Word. At 43, I still experience pangs of needing to hear something akin to what Bev's father said to her. I have lived most of my life not knowing my own father (for some very good reasons). That reality has at different times caused me to feel independent, smug, numb, and deprived. While the absence of a father leaves a void, it also presents a portal to knowing the one and only, truly perfect Father who is God in heaven. As a young girl and college student I enjoyed creating an imaginary dad for myself by cherry picking traits from my friends' dads and other men I knew, to make a composite of the dad I dreamed of as my own. This fantasy man was perfect maybe, but definitely non-existent. Now as a 43 year old adult, I see that even those most glowing and desirable traits are merely a reflection of the very nature of God the Father. As a believer, why not go right to the source and relish in my position as His prized daughter? The Wall Street Journal ran a story yesterday in tribute to a father who epitomized the tough love of a generation ago. It made me cry, but not with yearning. My personal fantasy dad was no Mr. Helliker (notice he did not have daughters)! His strength of character and courage are of a bygone era. What it underscored for me though, is how dimly we see in the mirror the mystery of all God encompasses. He is strong, yes and tough and just and fair but, all at once He is also gentle, good, kind, tender, affectionate and expressive. One of the most moving weeks in my Bible study this winter was Week 7 in Living Beyond Yourself. Beth Moore, as only Beth can, drills down deep to illustrate each fruit of the Spirit. God not only comes alongside us in kindness to help us parent our difficult children but He is also our parent. He comes to us--no matter how old--and "allows His throne to become a rocking chair." Just as babies need to be held, rocked, and soothed by parents in order to grow and fully develop, we need to let God love us as His children. We "can't know God only as the Sovereign Judge. 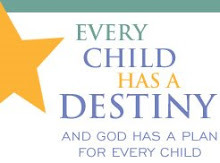 We must also know Him as the nurturing parent--or our growth will be stunted." The Father's Love Letter was popular a couple years back. I copied its verses into a spiral journal to read to my kids at bedtime. It is still a beautiful compilation of The Word from the Father to his children. Take some time today to watch, read or listen to it. You are loved. Out From Under: Disability, History and Things to Remember is the title of an exhibition at the Royal Ontario Museum in Toronto through July 13, 2008. It promises to be a powerful display chronicling the history of disability through personal narratives drawn from 13 diverse objects including a braille watch, a ventilator, and a death certificate. Podcasts are available online in lieu of traveling to Toronto. Out From Under was produced in collaboration with students, scholars and alumni from Ryerson University. Audrey King who donated the ventilator bed on display recalls, "Only years later, did I realize ... the embarrassment was not the assistive device, which in reality liberates ... It was – and still is – the bureaucracies and support system inadequacies that confine people and rob them of freedom and choice." Isn't that what Ari Ne'eman was saying on Good Morning America yesterday? It is the same sentiment that inspired my friend, Diana Pastora Carson, to found Ability Awareness. Hear the hopefully familiar ring in her words about her brother, Joaquin. "The experience of being disabled by his environment more than his autism continues to inspire me" to give workshops that educate and change public perception. She spoke to kids and leaders last summer at SportsJam at our church as we learned from guest speakers with various special needs. 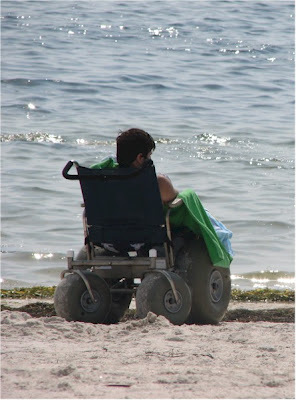 We raised the kids' awareness and the kids raised money to purchase beach wheelchairs like the one pictured above for our local lifeguard stations. Diana is another example of how siblings rock the world! She is one of the speakers preparing for University of San Diego's Summer Autism Institute "Autism: Work With Me, Not On Me" coming up June 23 - 25, 2008. Understanding history will spare us repeating it. The acceptance movement is not one voice in the wilderness. It is not even that new. But its time has come. Good Morning America aired a show today titled, Controversial Movement: Autistic and Proud, Activists Stop Looking for a Cure and Accept People As They Are. It is important to see. It far outweighs any coverage of Jenny McCarthy you may have seen in recent months. You can watch it here as video or read the brief transcript here. The guest speakers, Kristina Chew and Ari Ne'eman have a blog and a website respectively which also deserve a peek. Kristina is a parent whose great line in the interview is "Acceptance is the beginning of hope." Ari makes a cogent observation that every civil rights movement in history has had detractors and resistance. He is right to think of it on that scale. I find it profoundly coincidental that this aired the same week as Harriet McBryde Johnson's death. She loomed large as an advocate for disability rights protesting Jerry Lewis' telethons because of the discrimination they perpetuated toward those with muscular dystrophy. As a child with severe dystrophy, she believed she didn't have long to live and resented the implication that her only chance of happiness was a cure. Sound familiar? Her book, Too Late to Die Young, while inflammatory and challenging to read, is seminal to the disability rights movement. Society's stereotypes should not get in the way of people living their lives or meeting their potential. What I want for Reid and what Kristina Chew wants for her son is progress toward his greatest potential, not a cure. By the way, that is the very same thing I want for my daughter. Harriet McBryde Johnson influenced many others including Michael John Carley, Executive Director of GRASP (Global and Regional Asperger Syndrome Partnership). After reading her article, Unspeakable Conversations, wherein she defends her own right to life, he saw the parallels to the autism community and felt compelled to lead the charge at GRASP. His interview on NPR's All Things Considered 2 years ago had virtually the same title as today's Good Morning America piece. What is so "controversial" about wanting acceptance instead of cures? Years ago, we had an opportunity to talk over dinner with Tony Attwood who was in town for a seminar. It was a thrill to go around a table of 10 and be able to ask him questions. My husband, inspired by his associations in Silicon Valley and a recent article in Wired magazine, asked Mr. Attwood to expound upon the competitive advantages of being on the autism spectrum. How could we, as parents, help harness those in our children (not cure but push to progress)? Mr. Attwood's answer was astounding (then and now) as he took the concept one step further to suggest that the increased incidence of autism could, in his opinion, be an example of natural selection in our species. While I am far more creationist than evolutionist, I hear his point. There is an unmistakable genius in what we diagnose "abnormal." I love this quotation as it relates to children on the autism spectrum, many of whom sing before they talk. Others sing and never talk. No matter, they can still pray. Prayer is two-way communication with God. It encompasses both talking (with the mouth and/or the heart) and listening (with the heart and/or the ears). During the baptism, our pastor, Josh Kerkhoff, called on those of us standing in a circle to pray aloud for Reid. One of our friends, Kathleen, who is many things including poetic, prayed something to this effect: Lord, you are the Word and today you are present here in word and in song. I ask that you will communicate with Reid as he is dunked under the waves in a miraculous way with the music of all the angels in heaven. A beautiful sentiment and a prayer which God heard. Later that night as we sat on our patio eating leftover salads from the beach, I asked Reid, "so what was it like when Josh dunked you underwater?" He simply said, "it was like a symphony." Nothing more, nothing less. He was a boy of few words and now is a young man who still doesn't mince them. He often doesn't answer a question, especially an open-ended one like that. This time he answered and so had God! OK, here goes. 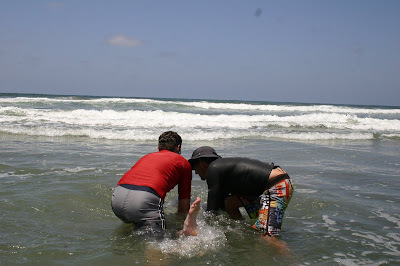 I have waited a week to post about Reid's baptism for several reasons. One is pure exhaustion from being overwhelmed by it all. I also hesitate in fear that I will be unable to retell the magnificence of the day. I don't want to trap the spiritual splendor in words on a page or in my feeble recollection. I have been silent for a week even from writing thank you's to those who made it so sacred in an effort to sustain the reverence and (if I am honest) out of speechlessness. Have you ever had an experience that was so sublime you wanted to keep it to yourself lest the reactions of others deny its reality? First of all, nobody stripped naked (did you read the "before" post?). What impressed me most was Reid's total engagement and appropriateness. These are lifelong goals for us which seemed for one sitting to be suspended in accomplishment. Granted, Reid loves a program and was prepared for how this would go. But somehow it was more than just a "good day" as measured by compliance, engagement, and behavioral goals. There were guests from Reid's sphere who had no idea of his functioning. Whether they hadn't seen him lately or they've only seen him glued to the television set in the church library, Saturday was eye-opening. Some were in tears. Some were flabbergasted at his ability. Others who've been in the trenches with us and spent hours of time interacting with him and seen the glimmers of skill and development over time were not amazed at any one skill but at how they all coalesced like jello hardening into one grand presentation. One of the 30 some eyewitness guests said to me, "Wow, Reid really 'gets' this." As his statement of faith Reid wrote a song with his music teacher, Angela Neve. The song served as testimony and sermon all in one. There was no mistaking his comprehension. What struck me was how obviously Reid's ability was displayed throughout the day. He demonstrated ability to sing, ability to lead a group, ability to grasp fundamental truths, ability to greet each guest and express gratitude for their presence, ability to share his faith, ability to take a break in the Eurovan with new gifts, ability to change into dry clothes we'd left in the van, and shocking ability to return to the party for more photo ops, ability to transition back into the Saturday routine with Dad once the party was over, ability to delay gratification and go to library after clean up, ability to help us set up and unload the van, huge ability to submit himself physically to be dunked backwards into waves, ability to regulate all the sensory and tactile input, ability to ask a guest if her husband was with her, ability to be a blessing to others, ability to have a ministry, ability to chose his own destiny for eternity. Depending on how long you have known Reid or what other firsthand experience you have with autism, that may seem like a simple list. To put it into drastic context, this is the same kid who was basically evicted from special ed class as a danger to other students just 4 years ago. This is the same kid who streaked naked toward the intersection of Executive Drive and Genessee Ave. from a pool locker room just 8 years ago. This is the same kid who is obsessed with doing things himself and only let me hold his hand once as a toddler. Are you getting why I'm speechless? Fourteen years ago when we were hoping to adopt we put this verse at the bottom of our solicitation letter. Ephesians 3:19-21 says, "Now to him who is able to do immeasurably more than all we ask or imagine...to him be glory...forever and ever." That verse has followed us and becomes more prophetic as we go. It rang true when we adopted not one but two babies. It continues to resonate as we move through autism. Ironically, the song which came to me in writing this seems drawn from that verse too. Terry Clark recorded it and it sums up my take home truth from the Reid's baptism. He is Able. We have ability because God is able. We are creative because He is the Creator. We are loving because He is love. We are truthful because He is the Truth. We are made in God's image however weakly we pale in comparison. Any among us gains functioning when we are in His presence, when we abide in Him, when move in His Spirit. I saw that happen dramatically for Reid on Saturday and I've seen it happen gradually over the course of 14 years. If you have a child with special needs, I challenge you to make a list of your child's abilities. You'll amaze yourself....and it will increase your faith. "Oh ye of little faith" was all I could think when I first sat down to write about the baptism. That verse is repeated by Jesus four times in Matthew. Usually, it is after a miracle God performed--multiplying loaves, walking on water, and then calming the storm. It is the phrase to use when amazed anew at God's power over the earth, the elements, the circumstances of our lives and our hearts. How fitting. I cannot believe what God has done in Reid's life....and is continuing to do. This speech given by Soeren Palumbo, a graduating senior, to his high school peers is a well-crafted and heartfelt call to action from a brother whose mentally challenged sister has taught him a lot. I give him credit for passing these life lessons on to others who have not had the privilege and benefit of loving someone with special needs. He defines discrimination against others especially those who cannot defend themselves. He does it graciously and unequivocally. If you ever wonder why God allows disability, Soeren gives one answer. My daughter, Allie, is learning this too. She has said on more than one occasion that she wouldn't change her brother. "Life would be boring without autism." She also realizes that it has shaped who she is in terms of patience, tolerance, and maturity. I watched the movie Molly last night by myself. My family--although they are mostly out of town this week anyway--have grown weary of the disabled flick-a-thon. Not me. The brother in this story grew up mostly embarrassed of his sister who had autism. They develop a friendship when she miraculously gains mental capacity from an experimental procedure. As the progress wanes, he has to relearn what personhood and love really are. He learns it from a learning disabled orderly at the institution where his sister lives and from his sister. What if the real miracle cure is acceptance? I just watched Snowcake starring Sigourney Weaver as an adult woman with autism. The movie is quirky in a Canadian way. It is an portrayal of autism updated from Rainman to be sure. Some scenes I love, like the one above. They capture the glimmers of genius which those who look find. It speaks of forgiveness, redemption, and hope. The ending unknowingly illustrates a Biblical principle of neighborly love. Though she is reluctant and unappreciated for it, Maggie chooses to serve her neighbor with autism by taking out her trash--her most dreaded task. As far as I can tell, the story is fictional. The Collector of Bedford Street is true. This award winning documentary by Alice Elliott about her own neighborhood is an even better example of what the Bible calls us to do and how we are to do it--joyfully! Larry's neighbors care and take action using their gifts (financial planning and filmmaking) to provide a secure future for him. Larry is mentally disabled and also has gifts of his own (compassionate persistent philanthropy) which he employs for the benefit of society. Enjoy the trailer below and the clever website which is complete with discussion guides for your church or faith group and a street map of Larry's neighbors . I miss New York. We had a neighbor who took us pleasantly by surprise when we first moved into a brownstone in Brooklyn Heights. Jean Anderson was her name and I met her when our mail got confused. My maiden name was Anderson. We sorted that out and would talk in the laundry room while she prepared for a ski trip (she was a sprightly 80 something)! In short order, I was invited up for sherry after work. She was intentional about neighboring which was not what we expected as newcomers to Cranberry Street. In hindsight it is more the norm in NYC than it is in Southern California. Alice and Larry are another case in point. I am hearing the lyrics of our old favorite song off Karen Henley's Beginner's Bible audio CD and her Good Samaritan videotape: "Look for a neighbor, he will be the one, always standing by your side, when the day is done." Autism Street blogger talks about a neighbor he learned a lesson from. What have you learned from one of your neighbors? And what have you done for one of them lately? Happy "Ban the Baby Stuff" Birthday! Today is Reid and Allie's 14th birthday. Allie is celebrating in Yellowstone with maybe an especially large s'more at the campfire with her backpacking friends. Reid and I will be at Chevy's with Carla and the "yippers." Chevy's is a Mexican chain near us where the staff loudly shout birthday wishes in English and Spanish preceeded by a distinctive "yip, yip, yip." As a toddler, Reid was totally freaked out by this, dubbed them the yippers, and would anxiously inquire of us each visit, "Will there be yippers?" It is impossible to predict whether any other diners in the place have birthdays on a given night. But, we tried. At the first sight of a throng of waiters or even just one carrying the token sombrero, we'd give the warning to "cover your ears" or "get ready, here come the yippers." Advance notice (or pre-correcting as they call it at Reid's new school) really works! Tonight, we'll be ready and waiting for 'em. This year I have dubbed the "Ban the Baby Stuff Birthday." Somehow marketing works with Reid. He can't resist the combination of advance notice and a catchy tune! Still enamored, obsessed, and inappropriately (:() consumed with Barney, Clifford, Elmo, and Teletubbies, Reid needs to move on. This is the drastic measure we feel we must take. I will wipe the hard drive of baby stuff; clear the bookshelves and library basket; and prohibit any new baby material to enter the house from this date forward. It's been a good vocabulary building opportunity. Reid asked me, "what does it mean 'ban?" And also, "where does the baby stuff go?" I answered honestly appreciating his skill of clarifying language and his submission to the plan. This may seem elementary to some but I know others will identify with the huge obstacle and catalyst for growth this represents. So here is my dilemma. What do I do with Arthur and Curious George? Don't you love the social skills and real life dilemmas Arthur, Francine and D.W. face and conquer? They are pragmatic heroes in my book. I learn from Arthur. And Marc Brown wrote chapter books in addition to the picture books and videos! That gives him extra points in my rating system. Definite gray matter in the ban. Don't get me started on George. We were discussing the ban yesterday in the car with my daughter and her friend who is a boy, also 14 and quite culturally relevant. His unsolicited comment was, "Curious George is not babyish." That was good enough for me. We can re-negotiate him? Way back when, I thought Curious George was a bad role model. He was always disobeying, or so I perceived. At some point along the line, my very own little monkey seemed to be a lot like George: impulsive with a huge heart, unquenchable curiosity and a penchant for pushing boundaries. Being a good mother to him was going to require a new perogative. In a children's bookstore, I caught wind of a conversation where another customer described Curious George as the original ADHD hero. The "good little monkey" inevitably gets into trouble and by the end of the story redeems himself with a good deed particularly suited to his unique skills and temperament. While Reid's diagnosis is autism not ADHD, I know if I wanted that one too, we could could get it. (I don't.) When he was young I often said if he'd lived in the 18th century he would have discovered a new continent. Exploration was his specialty. Slow, stop, and pause were not on his control panel. of each story. He can repeat the expectations back to the man with the yellow hat. But doing the right thing is a wholly different matter, for any of us. Do I need to give you an example? Reid knows it is not OK to bite people. He can win the Mind Your Manners board game hands down. However, in the heat of a moment when enough variables are thrown in like on a road trip through South Dakota with too much talking in the front seat, rental car chemicals, and a foreign scenery including bison outside the window he lost his senses, leaned over without warning, spiked from 0-10 in 20 seconds and bit Allie in the shoulder unaware. That was once, years ago. Countless times he has come up behind her, put his arms around her shoulders and spontaneously crooned, "Alllllieee I love you" with the gentlest of kisses. In those moments he is irresistible, like George. I have also learned more about the conception of George as spelled out in the YouTube clip above and in the book The Journey that Saved Curious George by Louise Borden. The book chronicles the life of H. A. Rey and his wife as they fled Nazi Germany on a bicycle with the George manuscripts in hand. Fascinating reading to further endear you to George. Curiosity is a very intelligent trait. 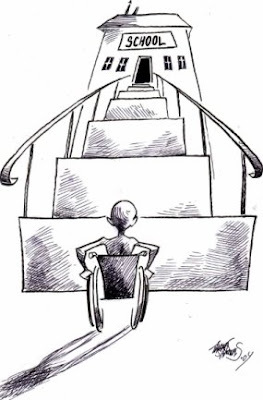 An article by disability activist, Kathie Snow enumerates it quite well. Not surprisingly, she quotes one of our other family heroes, Walt Disney. He was an out of the box thinker. Explorers, inventors, and many famous visionaries with inquisitive minds have redefined our history and culture. I wonder if we would be disabled as a society had some of our members not had such diagnosable traits. Now there's a curious thought. I think we'll keep George....for another year. Four Weddings and a Funeral had nothing on our weekend! With my mom in tow from Florida, we followed a flow chart made in advance so everyone was without excuse when I said, "meet you in the car" yet again. We went from my daughter's 8th grade promotion Friday morning to two parties. Woke up early Saturday for a packing meeting before her backpacking departure to Yellowstone then off to set up for Reid's baptism at the beach. That had to be the climax! Saturday night Carla and her sister-in-law came over for her last supper before running the Rock 'n Roll Marathon which is in town. Sunday was church for some and a dress rehearsal for Allie and Jim. We reconvened for Reid's recital and then picked up a friend to hear Allie perform in the Youth Symphony at Copley Hall with us. Home for dinner, then one last stop at Sports Authority (8:54pm) for hiking gear and to bed with us. My mom and Jim left on red-eye flights in there somewhere (I am not responsible for them). Carla showed up Monday morning at 5:00AM to be home with Reid so I could give Allie a proper send-off at the airport with her school group....and be home to put Reid on the 7:30am bus. Craziness? Adrenaline rush? Special occasion mania! I was touched by so many individual moments in the 48 hour period, I've become numb. I have enough blog material for the next month...now I just need a full night's sleep.